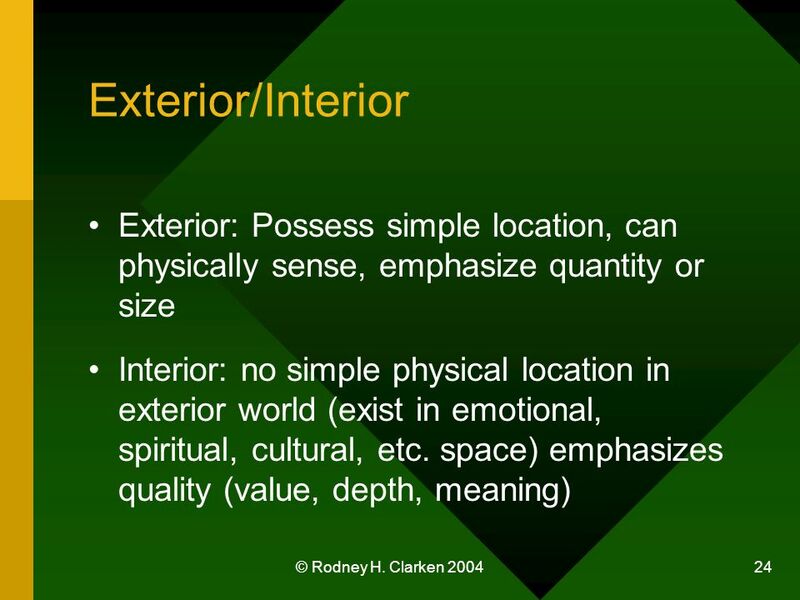 © Rodney H. Clarken 2004 1 Integral Psychology 3 Part Two: From Premodern to Modern Dr. Rodney H. Clarken Director of Field Experiences and Professor School. 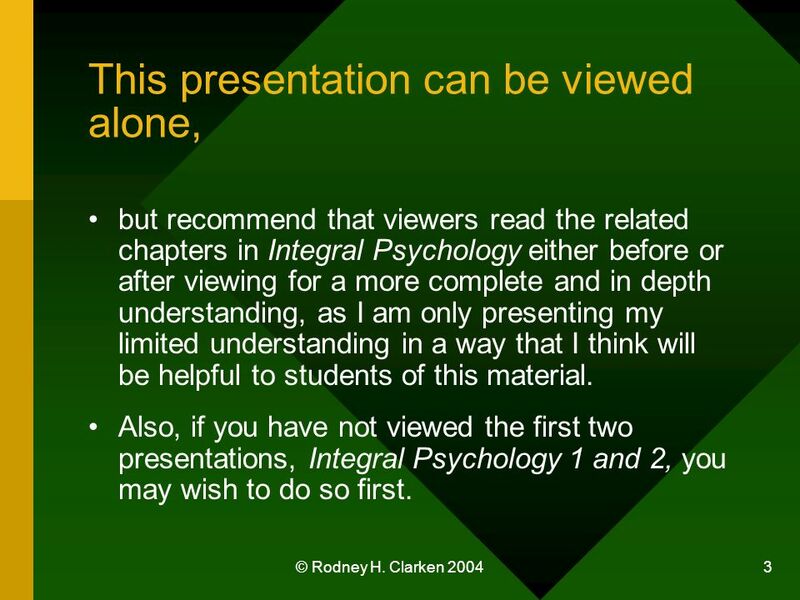 3 © Rodney H. Clarken 2004 3 This presentation can be viewed alone, but recommend that viewers read the related chapters in Integral Psychology either before or after viewing for a more complete and in depth understanding, as I am only presenting my limited understanding in a way that I think will be helpful to students of this material. 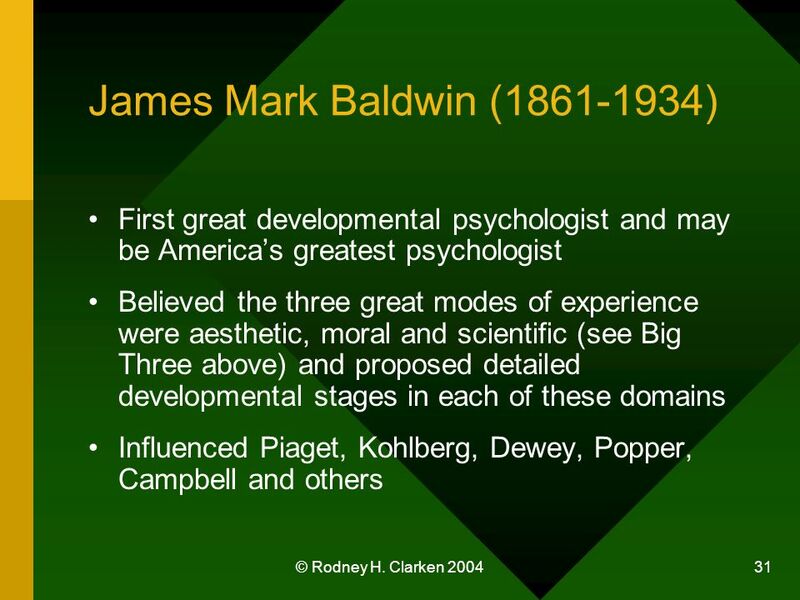 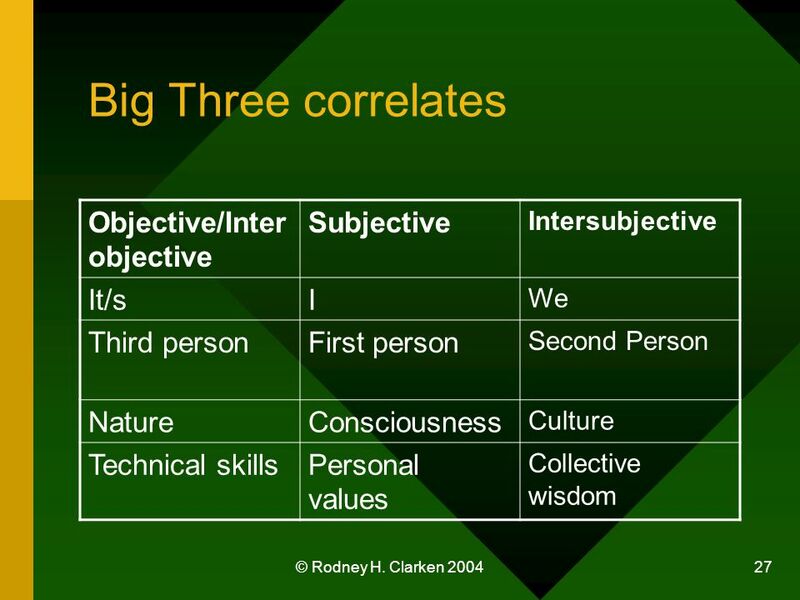 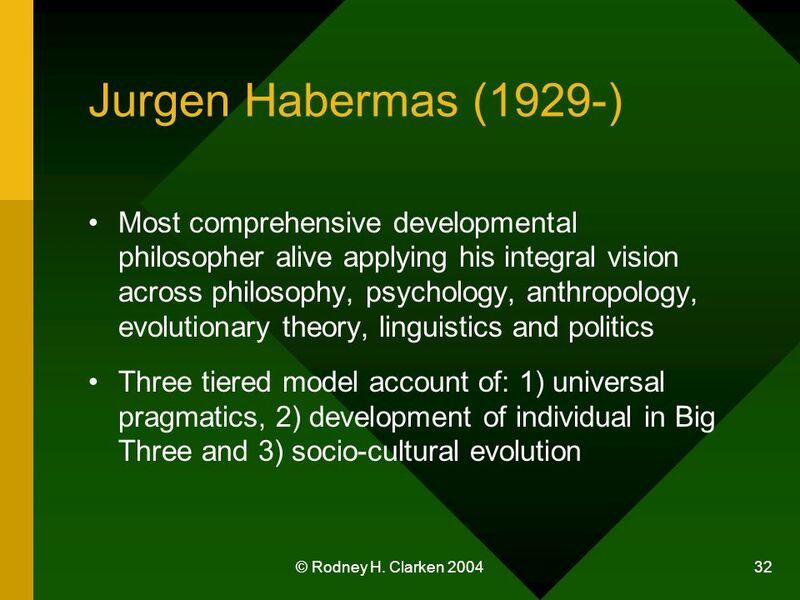 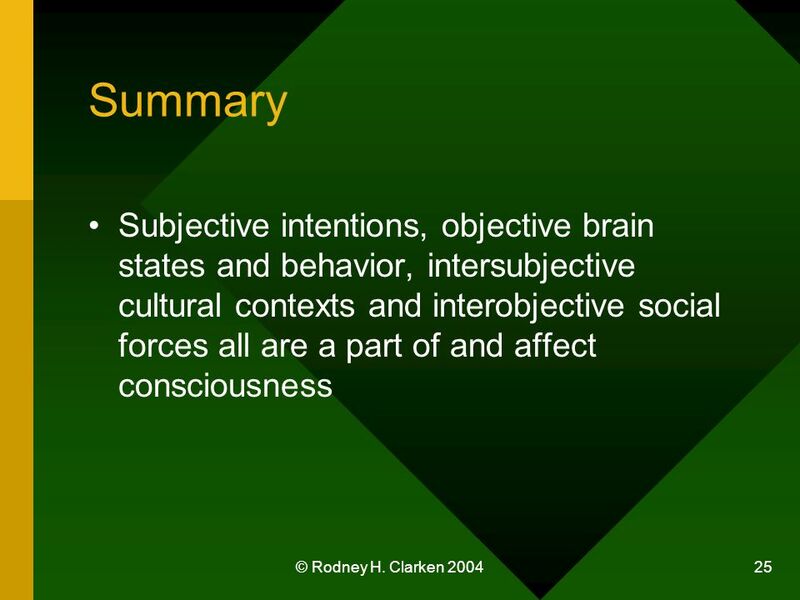 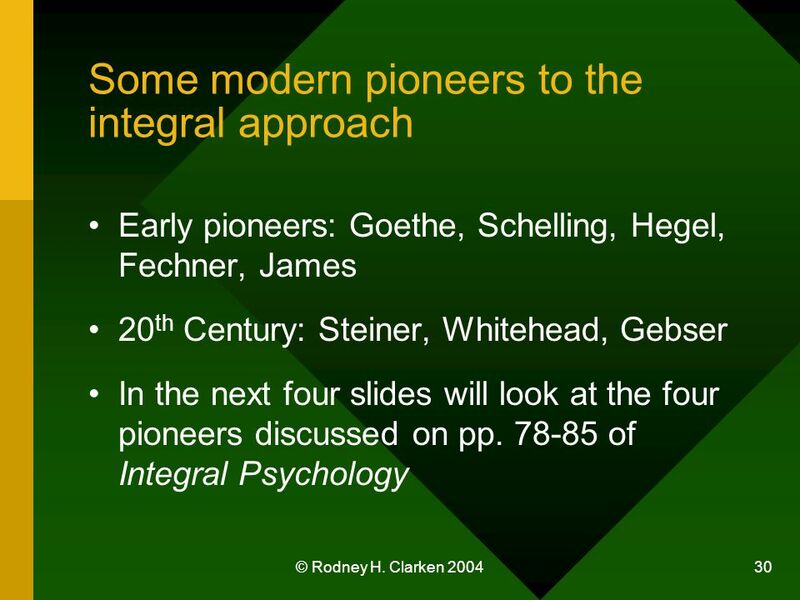 Also, if you have not viewed the first two presentations, Integral Psychology 1 and 2, you may wish to do so first. 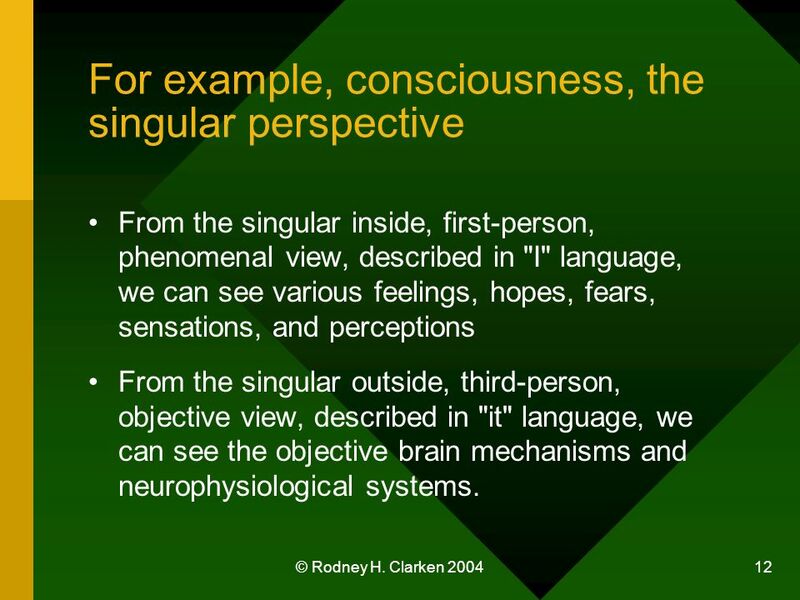 12 © Rodney H. Clarken 2004 12 For example, consciousness, the singular perspective From the singular inside, first-person, phenomenal view, described in "I" language, we can see various feelings, hopes, fears, sensations, and perceptions From the singular outside, third-person, objective view, described in "it" language, we can see the objective brain mechanisms and neurophysiological systems. 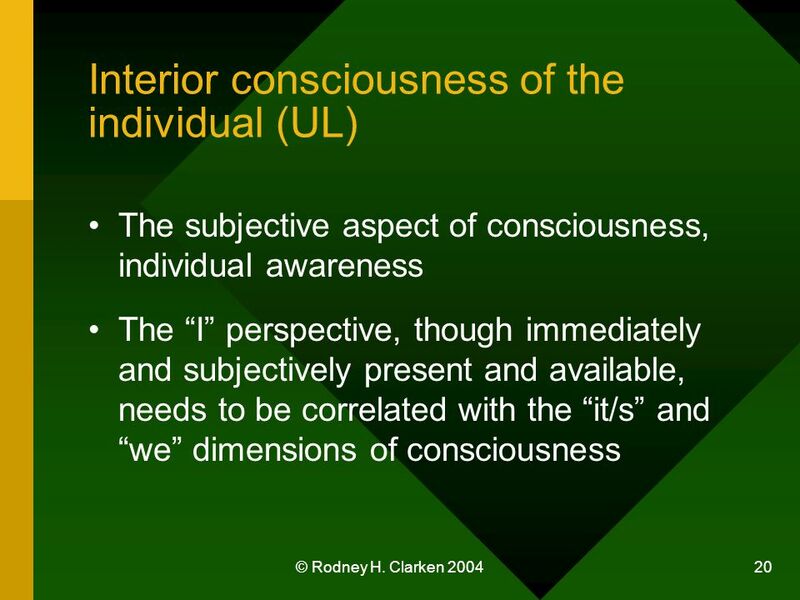 13 © Rodney H. Clarken 2004 13 In addition to a singular view Consciousness exists in the plural (as part of a group, a community, a collective). 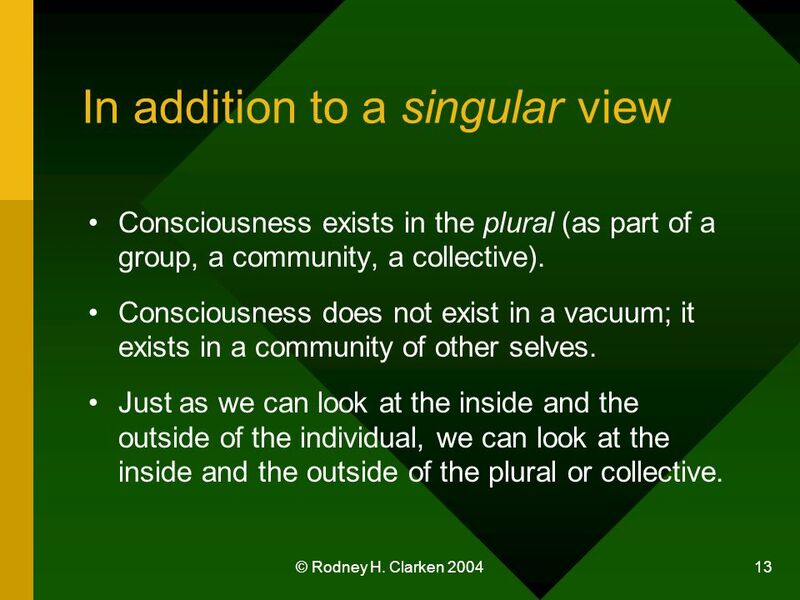 Consciousness does not exist in a vacuum; it exists in a community of other selves. 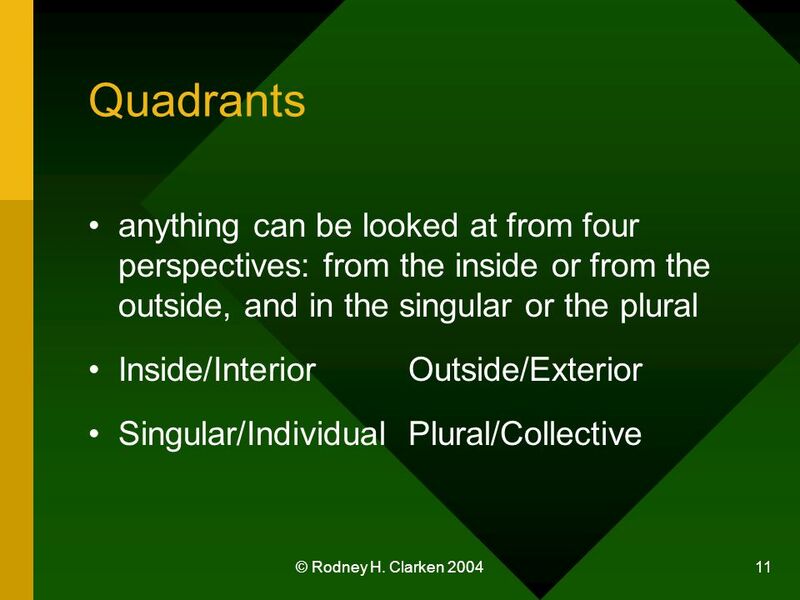 Just as we can look at the inside and the outside of the individual, we can look at the inside and the outside of the plural or collective. 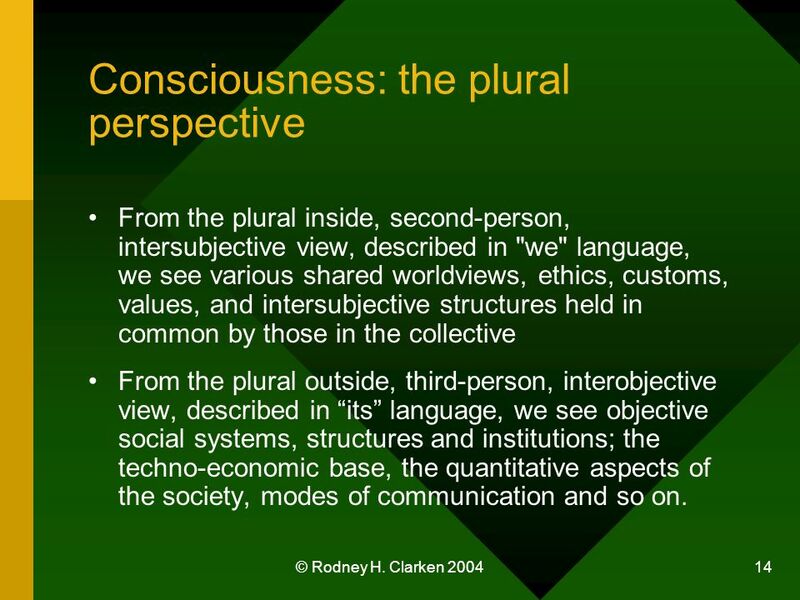 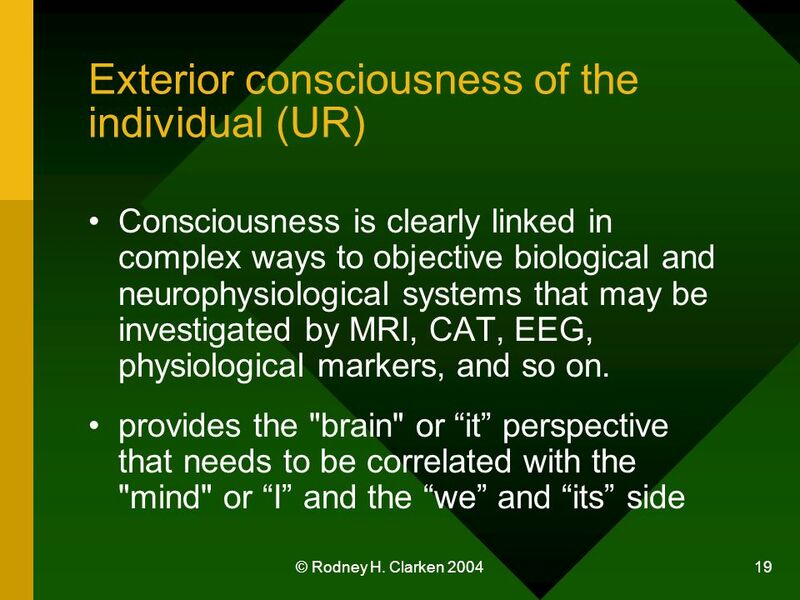 14 © Rodney H. Clarken 2004 14 Consciousness: the plural perspective From the plural inside, second-person, intersubjective view, described in "we" language, we see various shared worldviews, ethics, customs, values, and intersubjective structures held in common by those in the collective From the plural outside, third-person, interobjective view, described in its language, we see objective social systems, structures and institutions; the techno-economic base, the quantitative aspects of the society, modes of communication and so on. 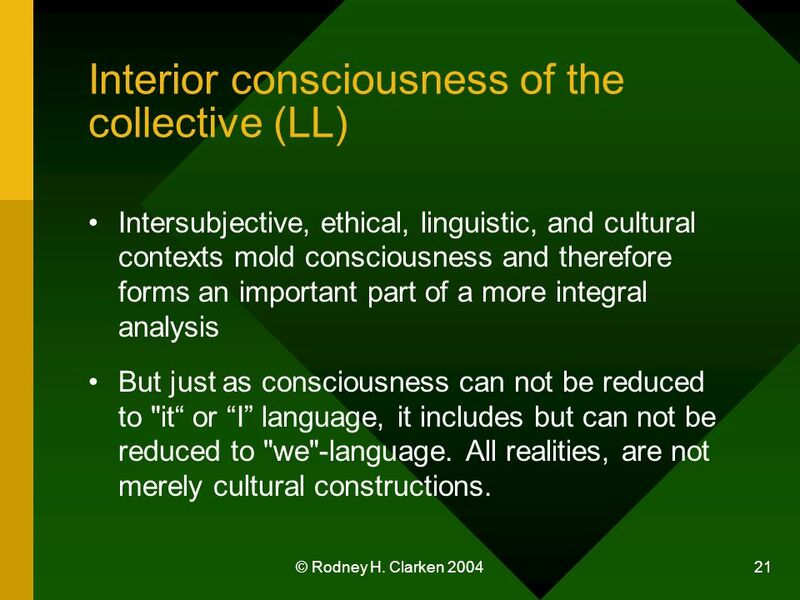 21 © Rodney H. Clarken 2004 21 Interior consciousness of the collective (LL) Intersubjective, ethical, linguistic, and cultural contexts mold consciousness and therefore forms an important part of a more integral analysis But just as consciousness can not be reduced to "it or I language, it includes but can not be reduced to "we"-language. 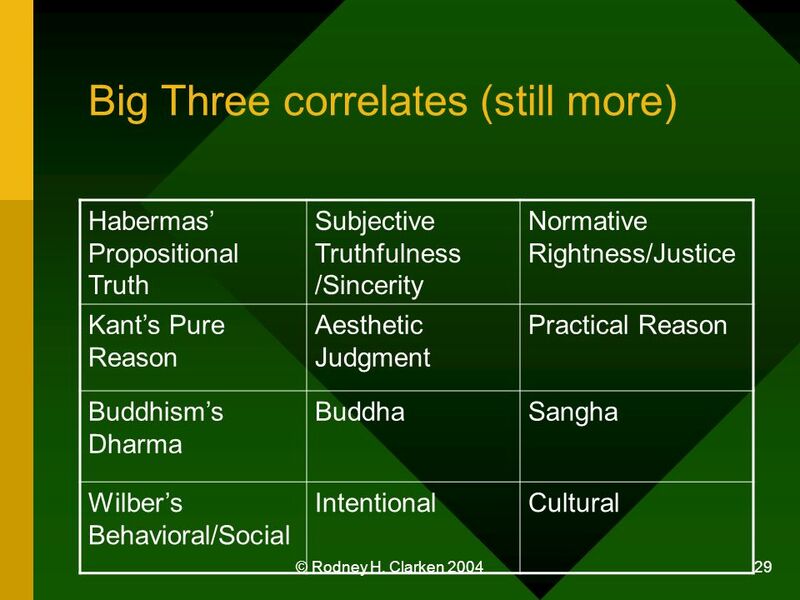 All realities, are not merely cultural constructions. 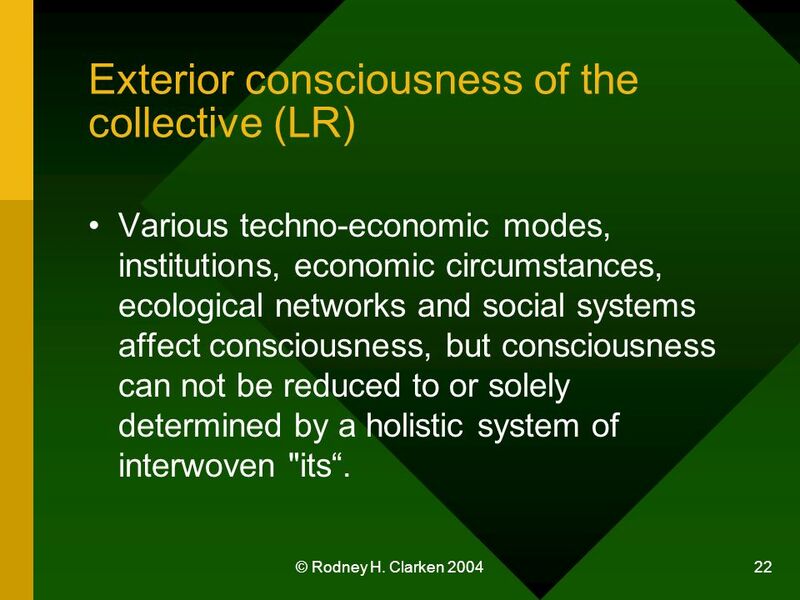 22 © Rodney H. Clarken 2004 22 Exterior consciousness of the collective (LR) Various techno-economic modes, institutions, economic circumstances, ecological networks and social systems affect consciousness, but consciousness can not be reduced to or solely determined by a holistic system of interwoven "its. 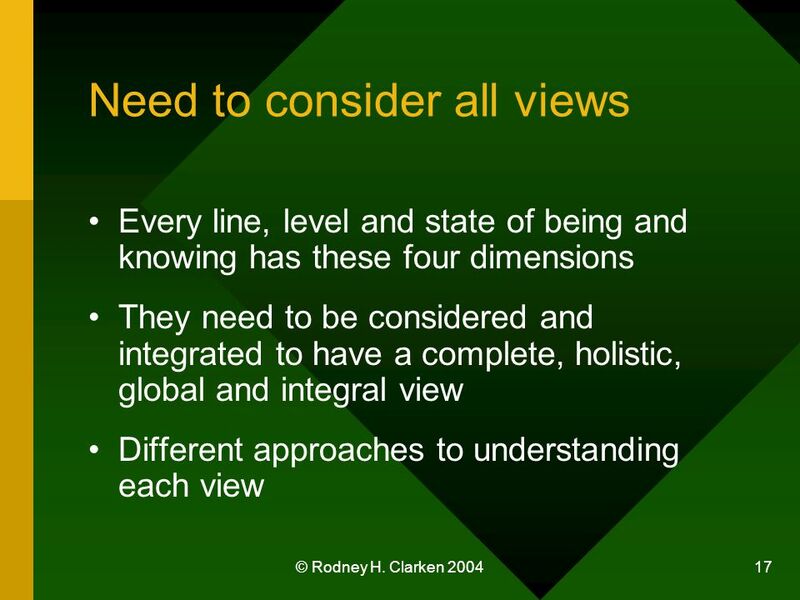 35 © Rodney H. Clarken 2004 35 References Most of the material in this presentation was taken from pp. 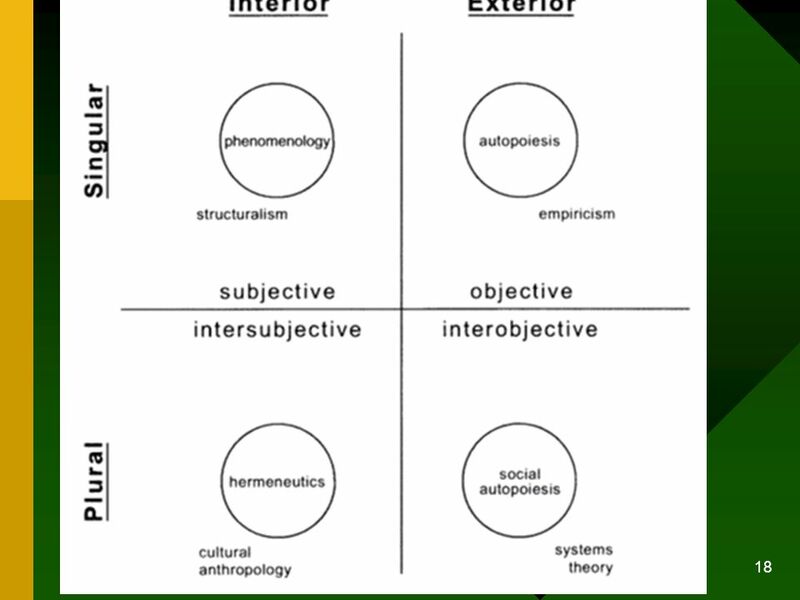 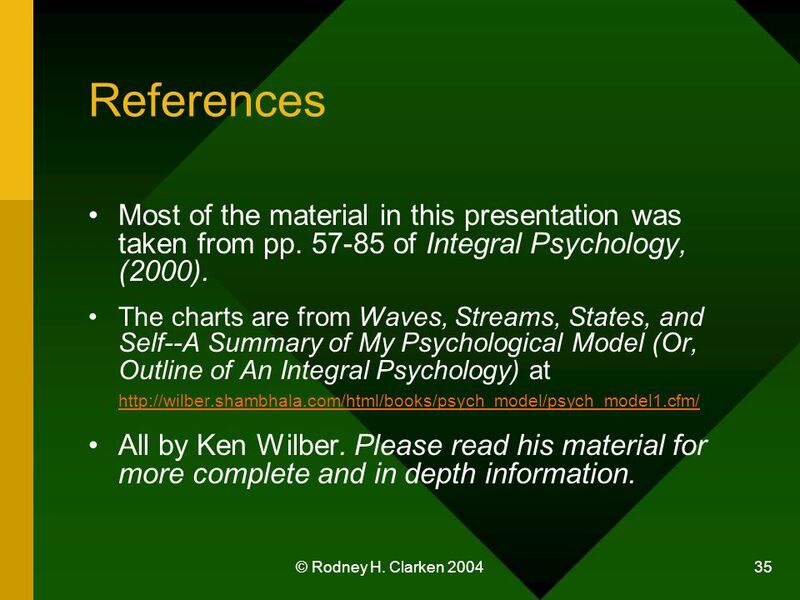 57-85 of Integral Psychology, (2000). 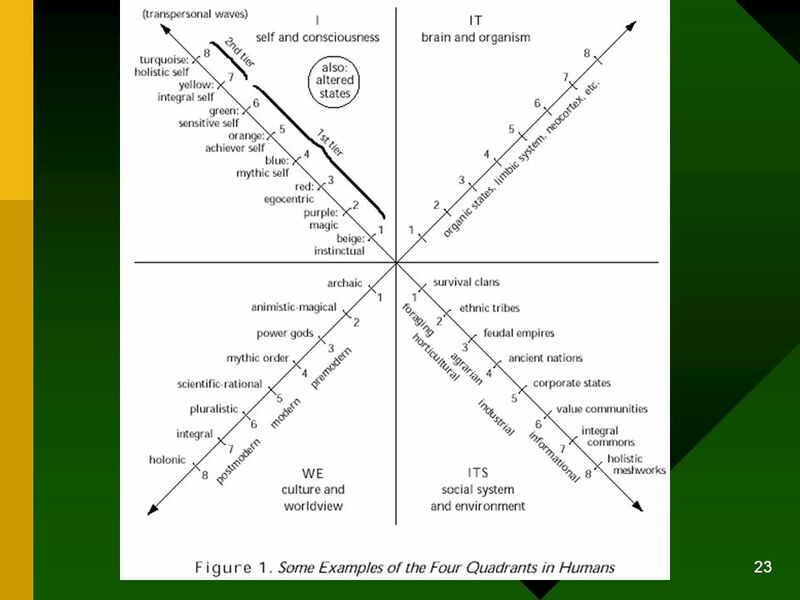 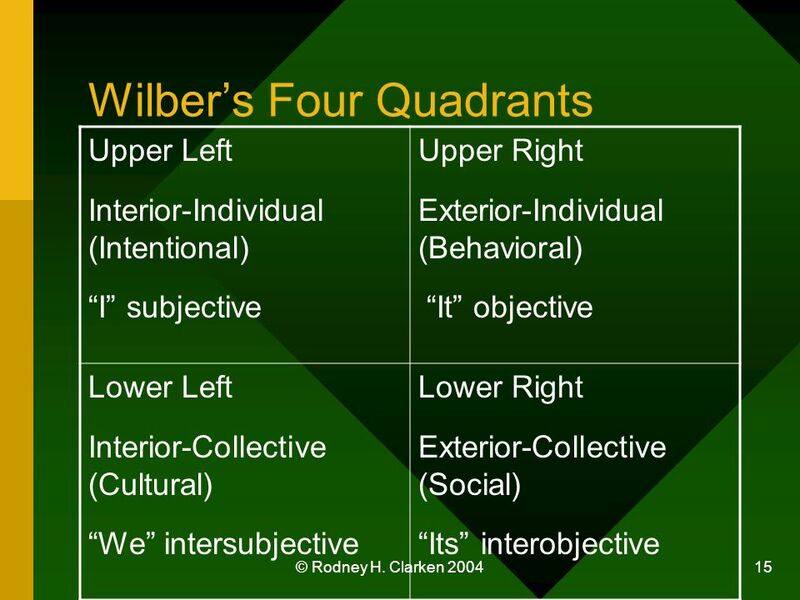 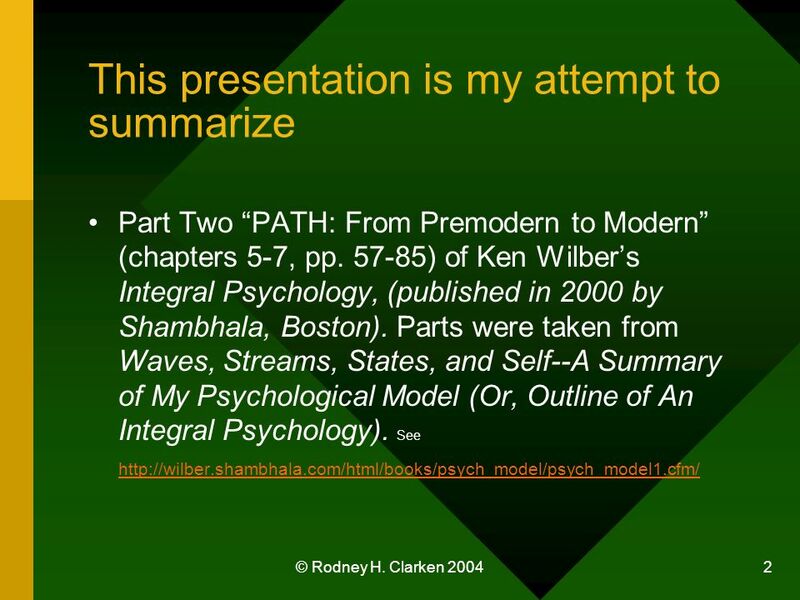 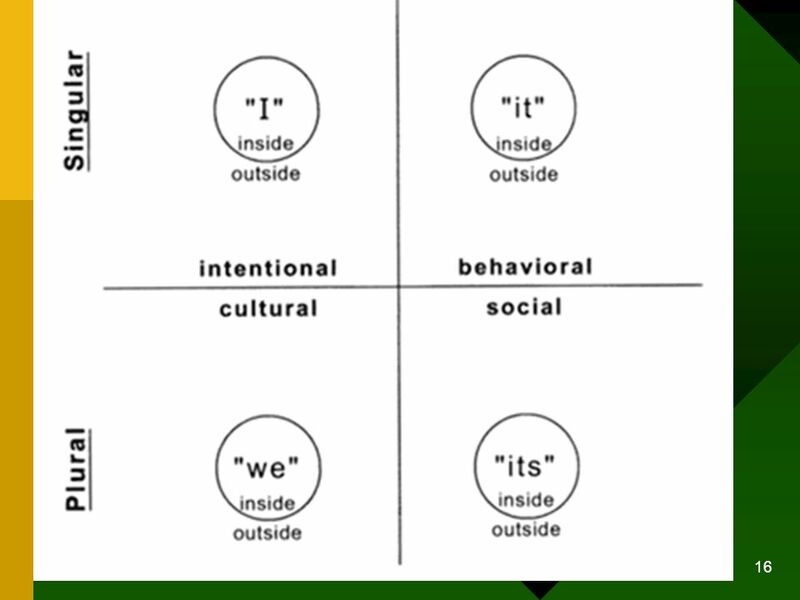 The charts are from Waves, Streams, States, and Self--A Summary of My Psychological Model (Or, Outline of An Integral Psychology) at http://wilber.shambhala.com/html/books/psych_model/psych_model1.cfm/ http://wilber.shambhala.com/html/books/psych_model/psych_model1.cfm/ All by Ken Wilber. 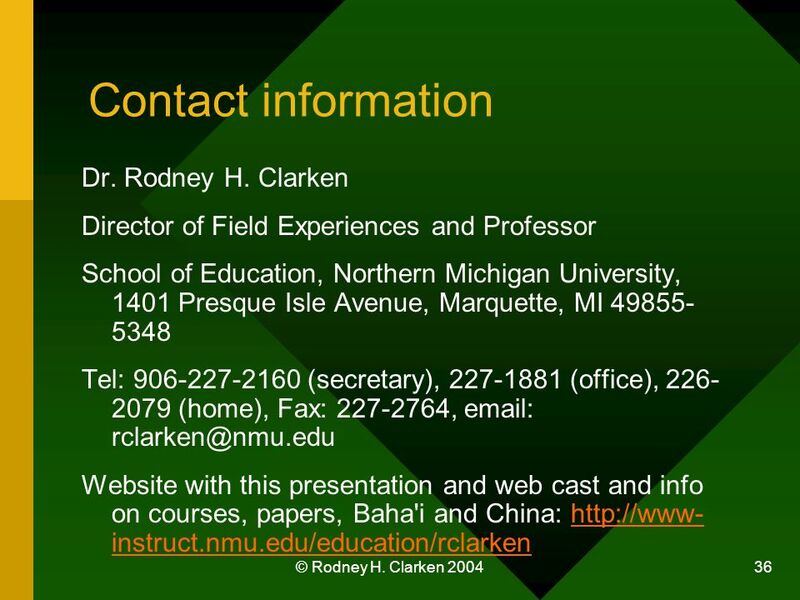 Please read his material for more complete and in depth information. 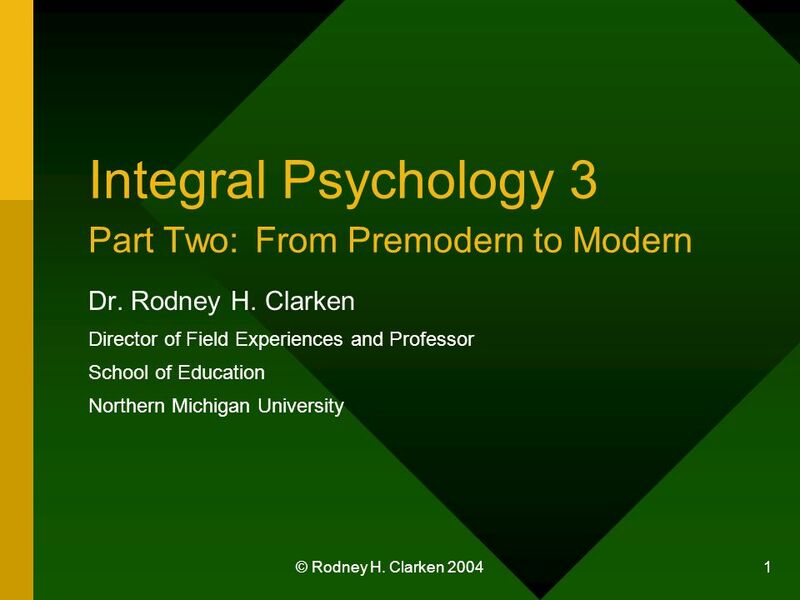 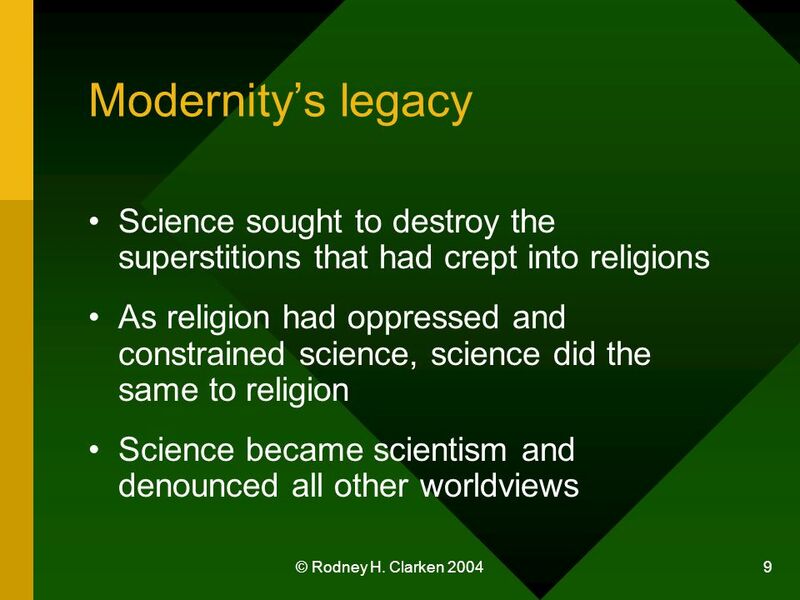 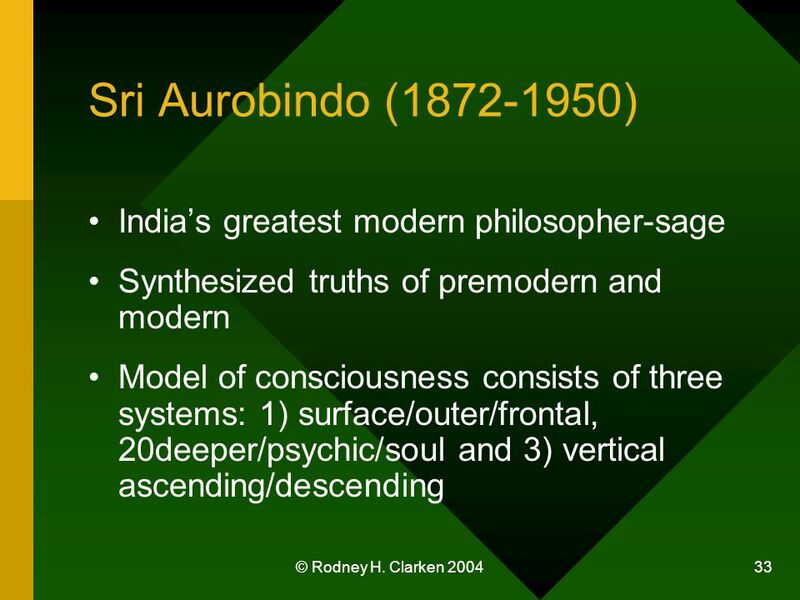 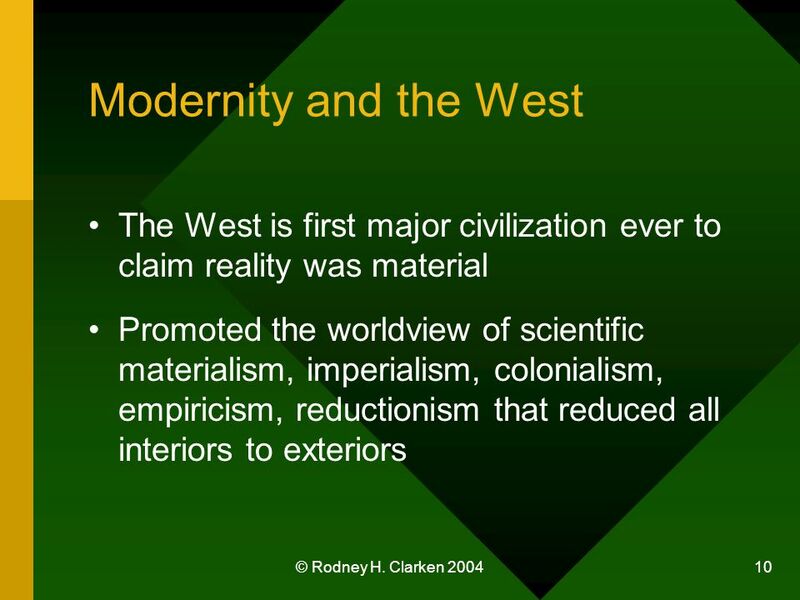 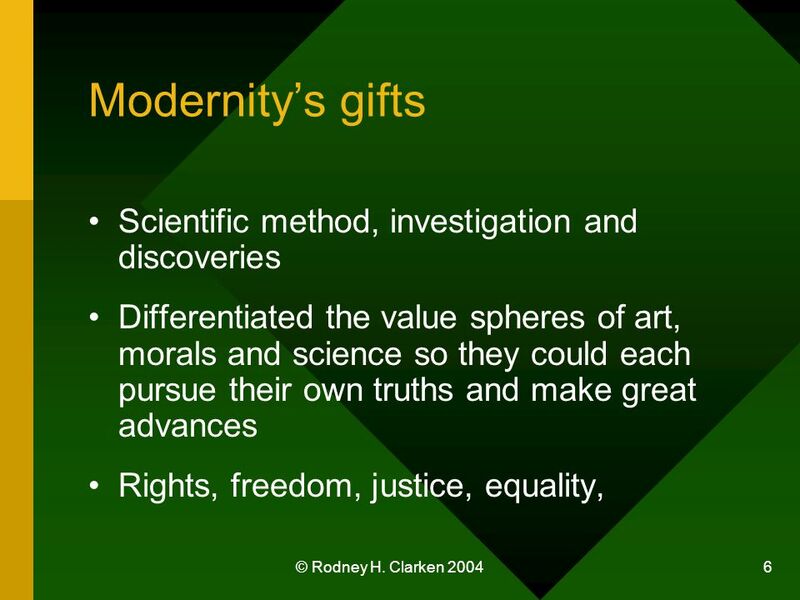 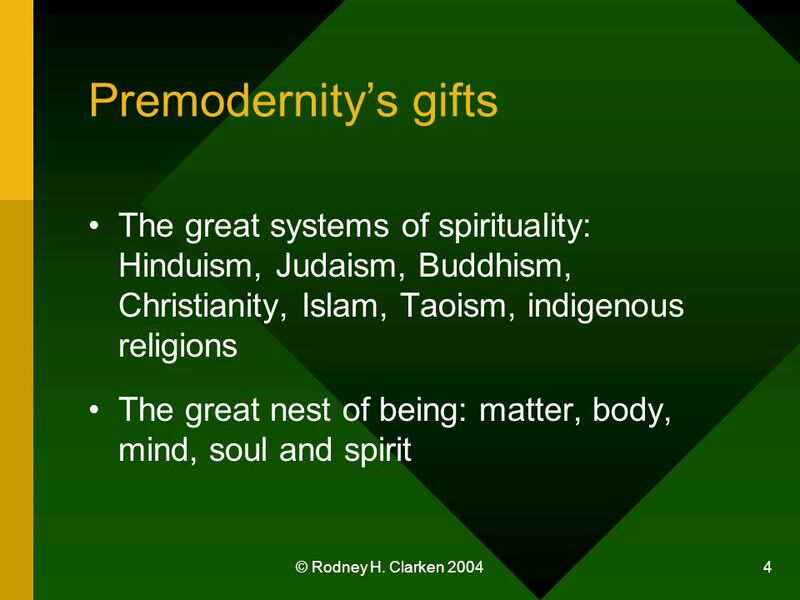 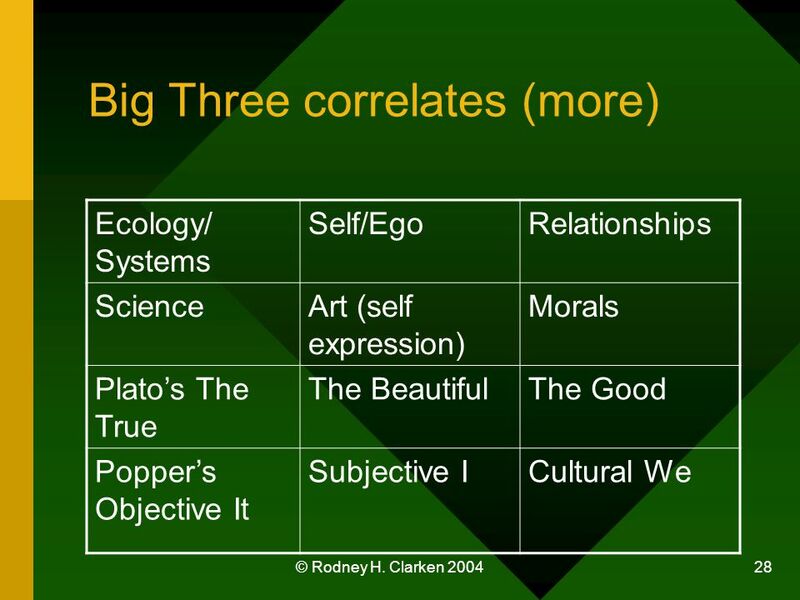 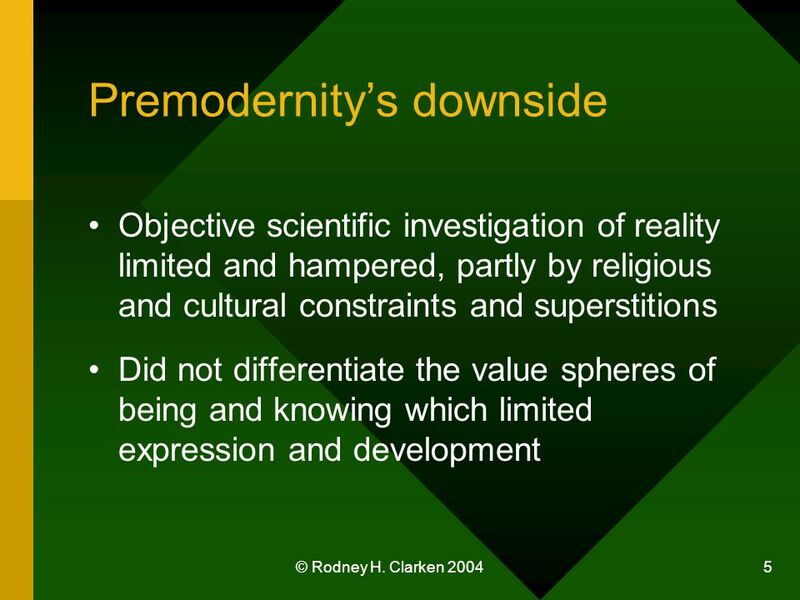 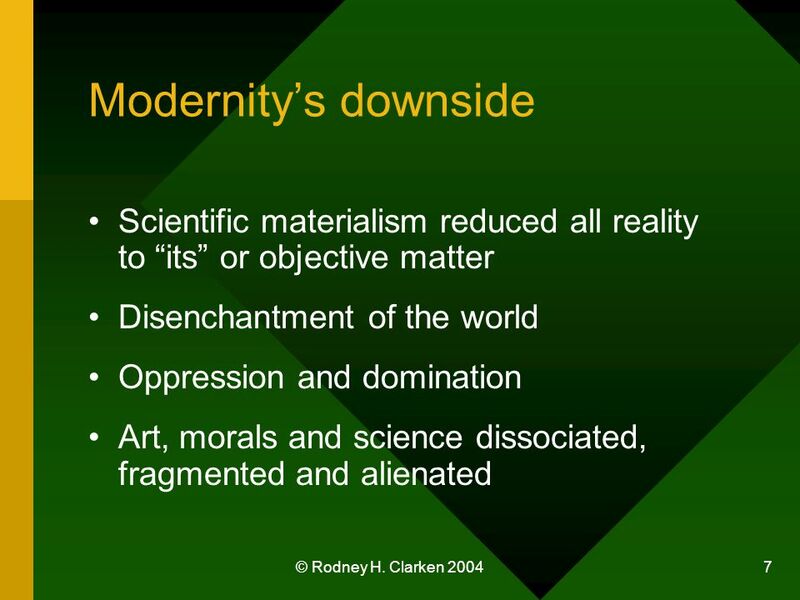 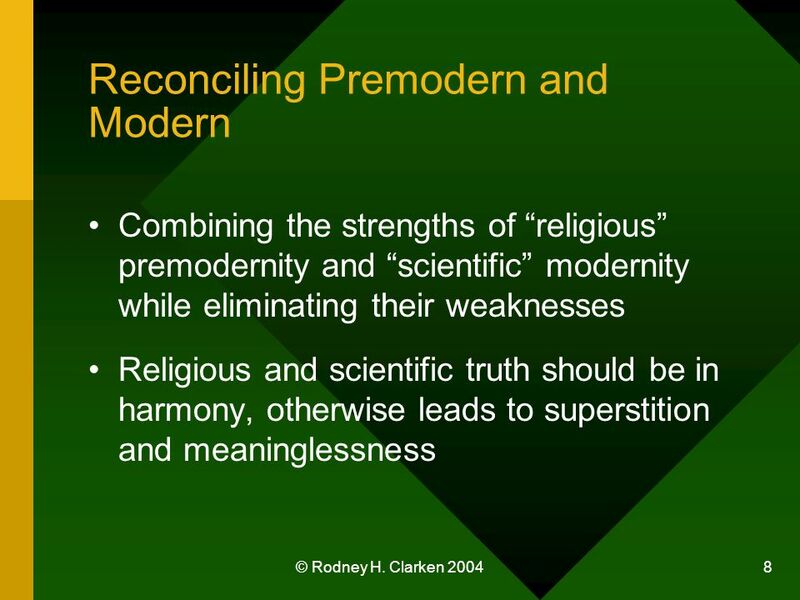 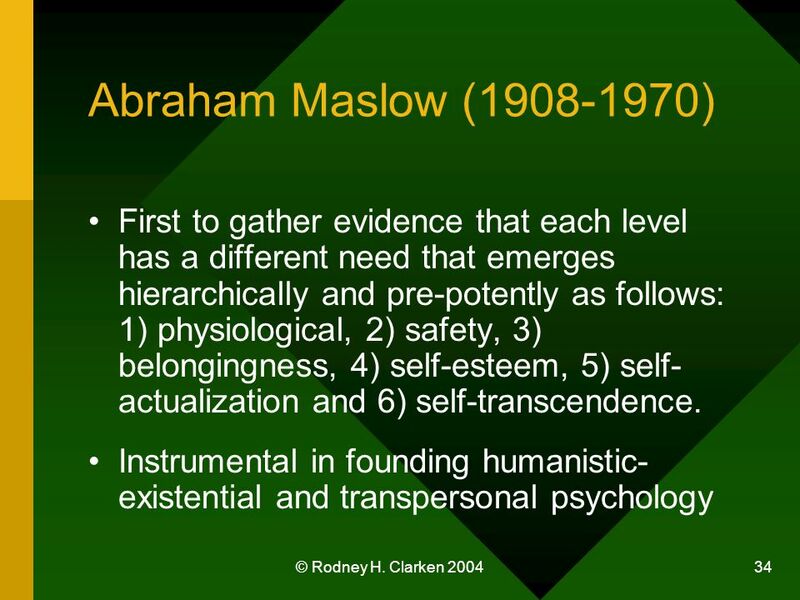 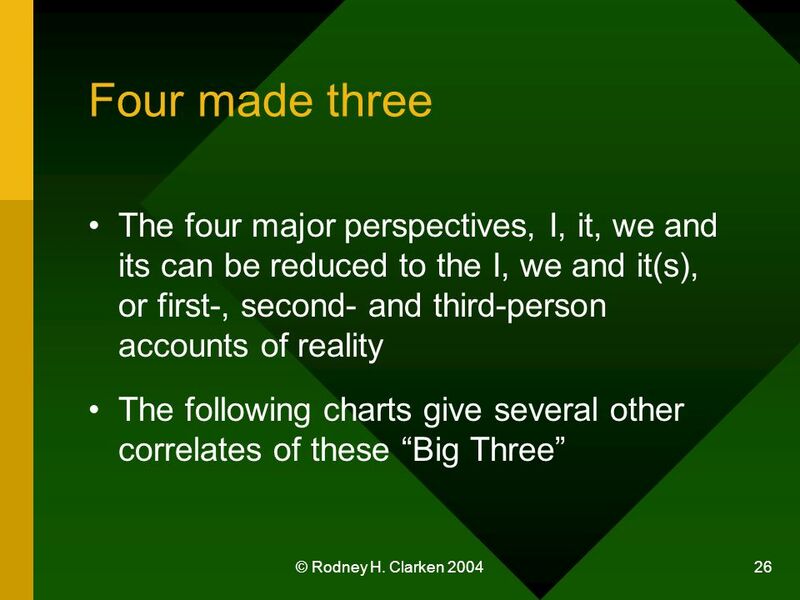 Download ppt "© Rodney H. Clarken 2004 1 Integral Psychology 3 Part Two: From Premodern to Modern Dr. Rodney H. Clarken Director of Field Experiences and Professor School."